*Regular nightly rate is $329. Weekly rate is stay for 7, pay for 6. Your reservation total will include a cleaning fee and bed tax in addition to the rental rate. Take It All In! 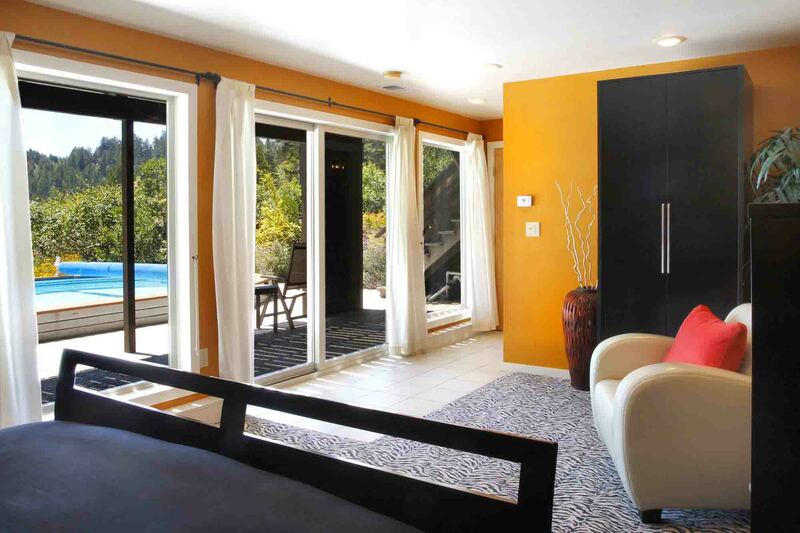 One-of-a-Kind Remodeled Modern Home with Spectacular Russian River Valley Views, *Seasonal Solar-Heated Pool (May-Sept), Hot Tub, Sunny Decks, Beautifully Landscaped Garden. 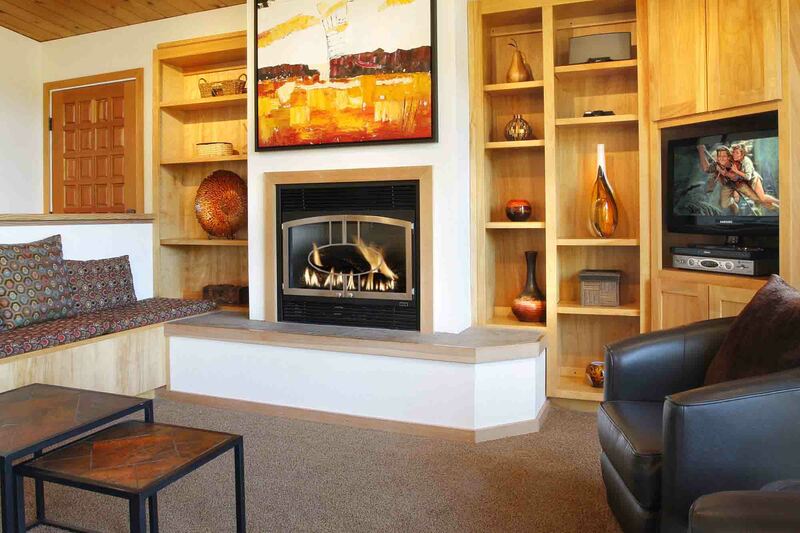 Central Heat, Gas Fireplace, Cook’s Kitchen. 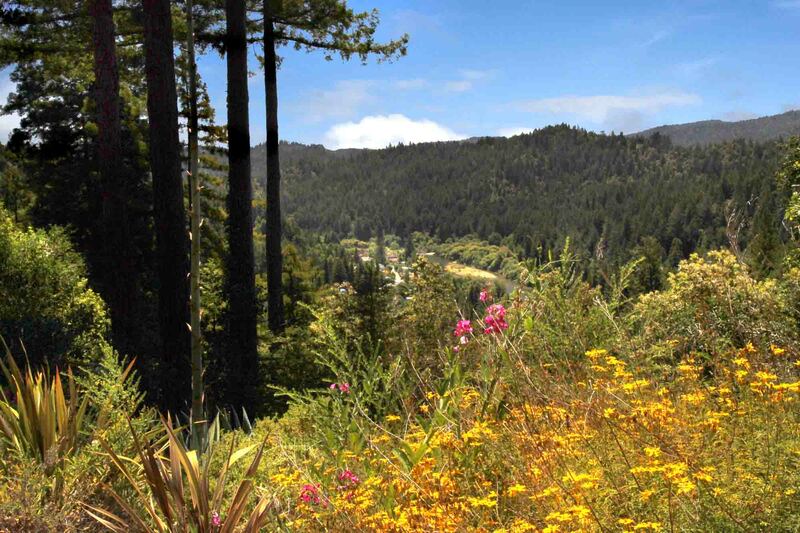 Short Drive to Guerneville, River Beaches, Golf, Hiking, Wine Tasting, Coast. Wi-Fi, Landline Phone, Cable TV. Keyless Entry. Your Well-Behaved Dog is Welcome! Soleil's upper level has an open floor plan with living room, kitchen, and dining area, which opens to a deck with outdoor dining. 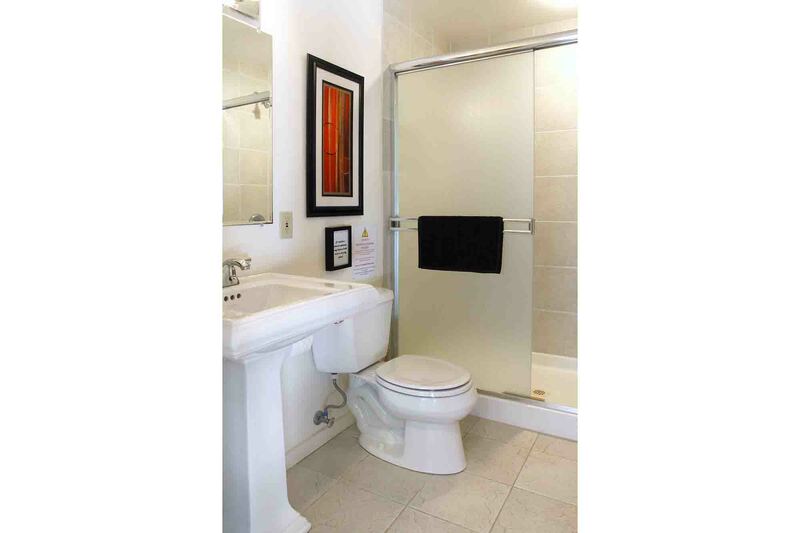 Also on the upper level, there are two bedrooms and a full bath. From the upper deck, there are stairs to the lower level (NO interior stair), which has a master suite with full bath and patio with hot tub and *seasonal solar-heated swimming pool. 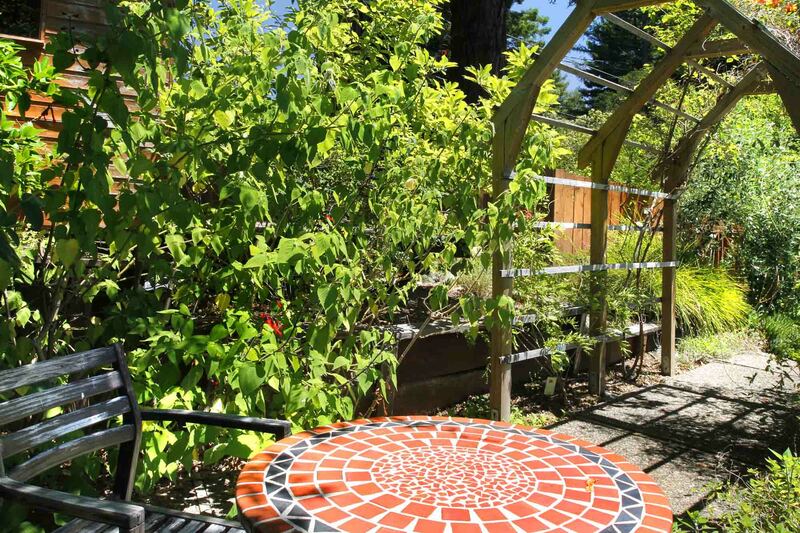 In the front yard, there are terraced gardens and outdoor seating. House is approximately 1564sf. Note that the pool is uncovered, there is a steep drop-off just off the deck in the rear yard, and the drive up the hill is steep. Max Occupancy: 6. Max Automobiles: 2 (limited parking). Quiet Hours 10pm-7am. No outdoor amplified sound at any time. *Pool is solar-heated May-Sept only. If your staying from now until summer be prepared. No A/C we lucked out and had great weather. But if it was 10-15 degrees hotter it would have been uncomfortable. The pool and jacuzzi needs to be cleaned. I did not have my family swim in pool or jacuzzi. "The house is very nice and clean"
The house is very nice and clean. It is in a secluded and quiet area with beautiful views. We had a great time. "The property and layout of the home is incredible"
The property and layout of the home is incredible. The pool and hot tub are wonderful. 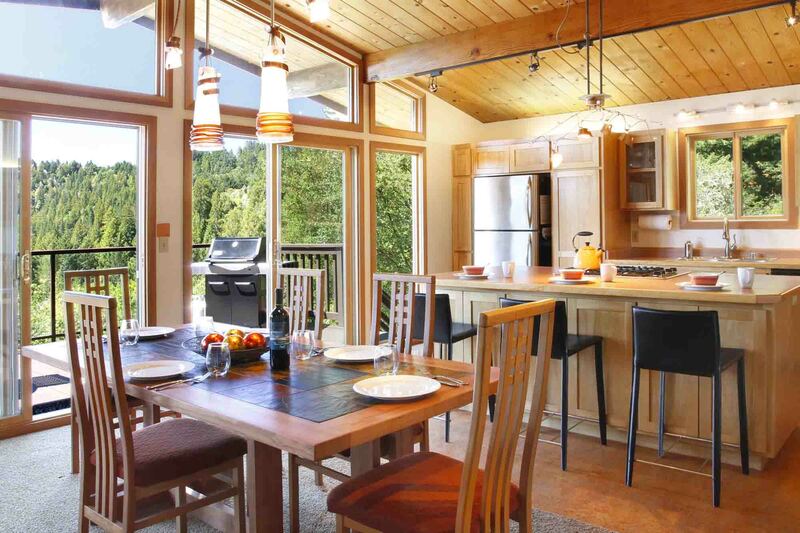 Kitchen and outdoor wraparound porch made for wonderful breakfasts and dinners that could easily move in and outside. The bedrooms were spacious and comfortable. Most of all, the views and overall vibe of the town (just down the street) were wonderful. Safeway, liquor store, wineries are all <10min drive and nature is... well, steps in any direction. Highly recommend Soliel!! It is clean, comfortable, well equipped and the views are breath taking. The pool is lovely with the same wonderful view and fairly private. 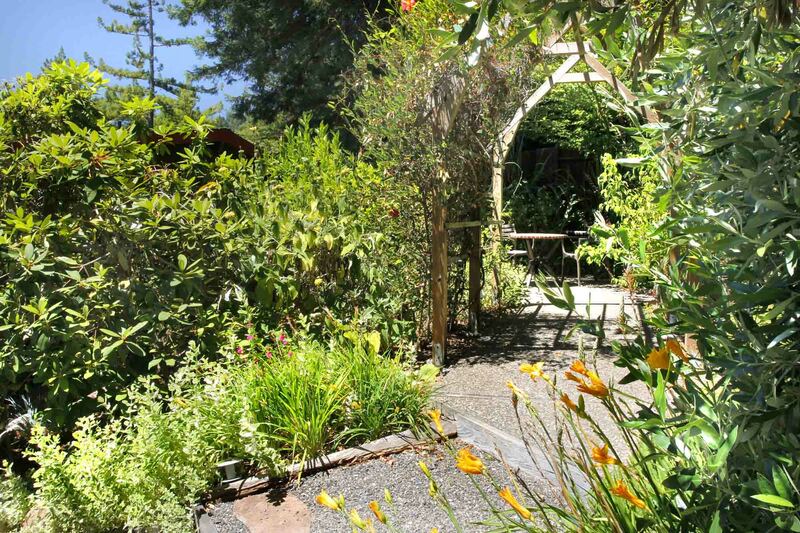 Very close to downtown Guerneville and a fun steep hill to drive up and down. We will be back. This place the definition of comfort and rejuvenation! "We had a wonderful stay at Soleil"
We had a wonderful stay at Soleil. Highly recommended, the space is fabulous and I'd go back in a heartbeat! This house is AMAZING! The views are gorgeous, common spaces are beautiful, bright. There's a big deck and outdoor tables and chairs to enjoy the view and sunshine. The downstairs bedroom offers a separate space for some additional privacy. There's a jacuzzi and a pool. Everything was better than expected!! I feel like the images don't even do the house justice. Would 100% return. Amazing views, beautiful house. 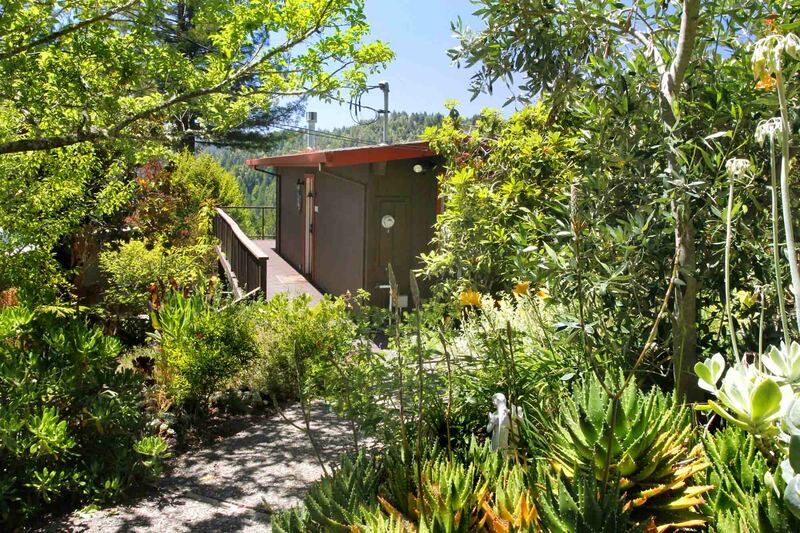 5 min drive to Downtown Guerneville. Great place for our family weekend away! WOW! This was one of the best experiences I've had lately. Such a wonderful property, incredibly responsive hosts and you can bring your doggies! We had such a great time just hanging out at the house and taking in the amazing view, while dipping our feet in the pool. I would absolutely book again. "Just a wonderful vacation property all around"
Just a wonderful vacation property all around. The gardens are lovely, replete with lemon trees and flowers of various kinds. The icy pool makes a wonderful contrast with the hot tub - and no doubt will be perfect in warm summer weather. There's a basic but good Weber gas grill and a well laid-out kitchen with gas range in a large island for prepping family and friends' meals. The view wall to the back deck frames a stunning view over Russian River and the River Lane / Lucky Bend area, and across to the north side a redwood forested valley. Super-relaxing to kick back with a wine and some grilled food. We'll be back! "This location had thee best views!" This location had thee best views! It was very private and pleasant. Would definitely come back to this location! Beautiful home with an incredible view! "This place is absolutely as advertised!" This place is absolutely as advertised! Super clean, comfortable, modern, and stylish. Kitchen was outfitted with everything you need and gas grill was working and fun to use. Amazing sunrise views and great location to do hikes, wine tours, and beach. Car must be able to get up a big hill, but once you are at the top you will be thankful for the beautiful gardens and secluded natural feel. Absolutely recommend it and will be going back! "Beautiful views and very quiet neighborhood close to Main Street"
Beautiful views and very quiet neighborhood close to Main Street. I wish they would have stopped by to inspect the house prior to our arrival as the bathroom on the main floor was covered in live and dead ants and the kitchen had spiderwebs. Would definitely book again. 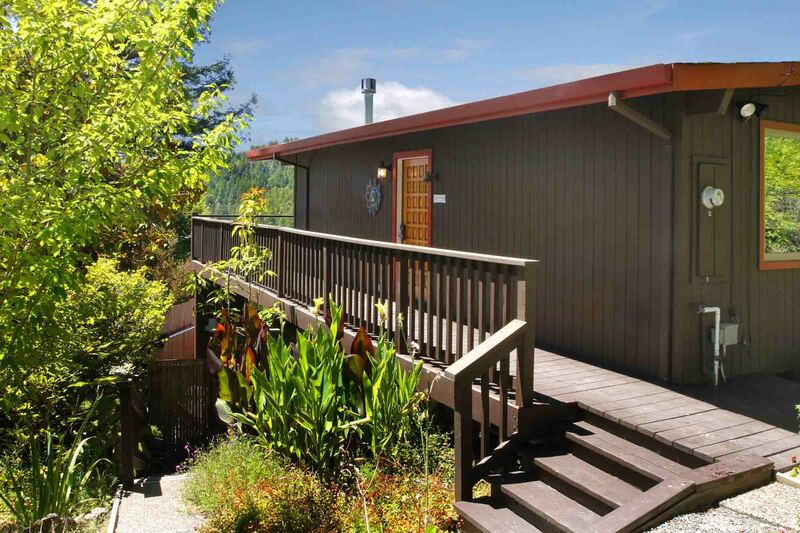 "Great location with beautiful views..."
Great location with beautiful views over the Russian River. The large, bright kitchen is well equipped. Perfect house for groups. Nice location for exploring Sonoma county and the coast. Description is accurate. Awesome scenic views of pine trees and Russian river. Great for groups and families. Had 2 mishaps. Owner has not yet replied. Thank you for the review and feedback, Rene, and we're very glad you enjoyed your stay at Soleil! We always respond to messages from guests, but we received no voicemails from you, so I'm not sure what happened there, and we found nothing major amiss after your departure. We'd welcome a message or call if you'd like to share your experience. "This cottage is in a truly beautiful location..."
This cottage is in a truly beautiful location with gorgeous views, a short (5min) drive to the Main Street. The house was large (for a family), comfortable and clean. We were a bit surprised to find the outdoor areas a bit run down (though functioning, for the most part) and we missed having a comfortable upstairs patio area in the evenings to enjoy the setting sun (though the pool beds were great). Also wished there we some amenities like pool towels, shower accessories, some dvds- small items to make this place feel more homey. This is probably in the property details but good to note that the pool is 3'8" deep only and there is no outside activity allowed after 10pm. "The view is like none other"
The view is like none other. We saw a few beautiful sunsets and found there was enough room on the upper deck for four of us to have a session of yoga as the sun was rising . We enjoyed the spacious kitchen and large dining table. We found there was plenty of space in the house to enjoy each other and to find privacy. Thanks for the review and feedback Renee! We're so glad you enjoyed Soleil! This is my 3rd time staying at this property. We go to the Russian River every year for the Blues and Jazz Festival. The house is very well kept and the view spectacular. Thanks for the review Rae Marie! We're glad to hear you enjoyed Soleil. "We had a great stay at Soleil"
We had a great stay at Soleil. The house was as described and check in was very easy with the key code lock. The views were amazing and the kitchen was well stocked for cooking. Also enjoyed the hot tub as it cooled down in the evening. "Fantastic view but very badly maintained house"
- the view over the russian river and redeoods is amazing. Sitting on the terrace overlooking that view is great - we had however an ant invasion while there, no hot water (during winter) several times, it had to be restarted everyday. The gas fireplace also stopped working during our stay. Tge heating did not work properly. The host/company is quick to respond and are very helpful. The place is an amazing place to stay! 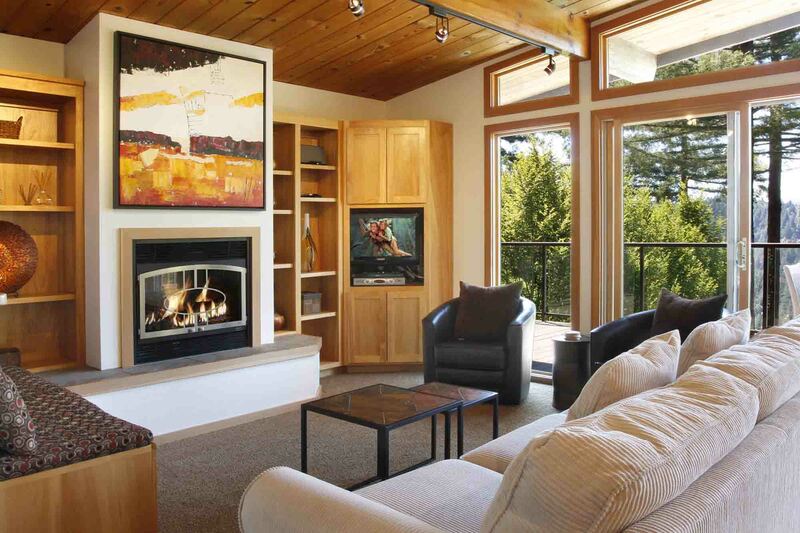 "The home was absolutely stunning..."
The home was absolutely stunning in its location - above the trees on the top of a hill overlooking the Russian River - and in its amenities. Everything was clean, beautifully decorated, and cozy. Though we didn't really use the pool (too cold), the hot tub was so great - we used it every day, twice a day in fact. Just what we needed for our time away before the holiday. It would be helpful to know that this property has 2 bedroom and 1 bath upstairs which is not connected internally to the bedroom downstairs (it's almost like a standalone suite without a kitchen). The neighborhood is also very quiet so even normal voices carry - there are signs all over to observe quiet hours. So if you are looking for a rowdy getaway that allows you to party in to the night, even though the amenities look like this might be the place, I would choose another. "Property was just exactly as pictured. Beds are very comfortable! I recommend this property!" Great place for small groups who appreciate the natural beauty of the area. Special thanks to Matt and Mike of the RR property management who responded promptly, thoroughly and completely to an inquiry ensuring our satisfaction. "everything you need for a fabulous time!" I rented Soleil for my 30th birthday celebration. The pictures of this home cannot do it justice. It has the perfect common area for entertaining, cooking and playing games, and is very open. 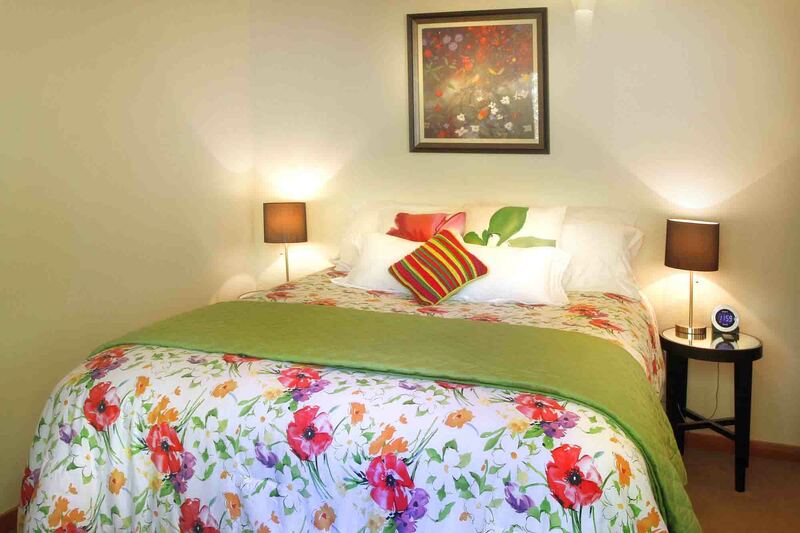 The beds are comfortable and it is in a serene neighborhood. And the view! we couldn't get enough of having wine on the upstairs deck and staring into the trees. Everything was spotlessly clean. 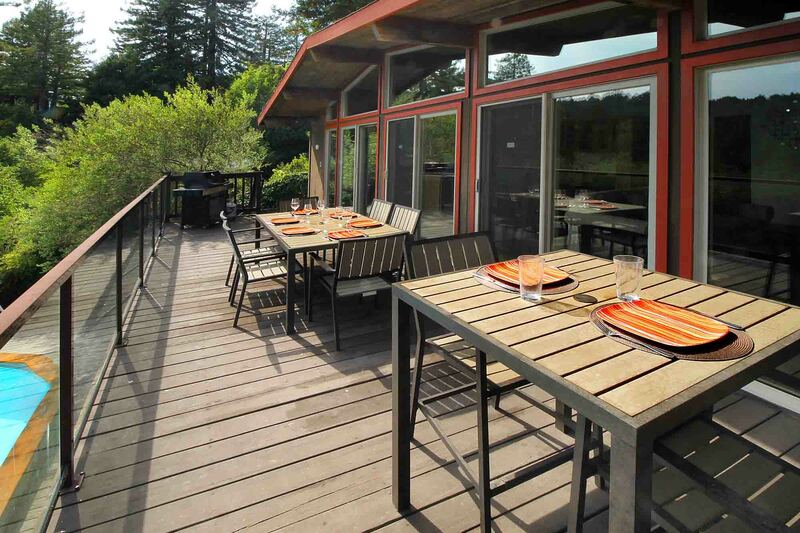 It is a short drive (3-5 minutes) to downtown Guerneville and a nice beach on the river. Also, take advantage of the abundant meyer lemon tree on the property! We used slices on our barbequed salmon. The pool and hot tub make this a place that you won't even need to leave. Great for an grown-up getaway or for families, too. Only caveat? bring your own cheese grater! "Just as lovely for our second visit!" My friends and I stayed in Soleil this past weekend and had such a lovely time. 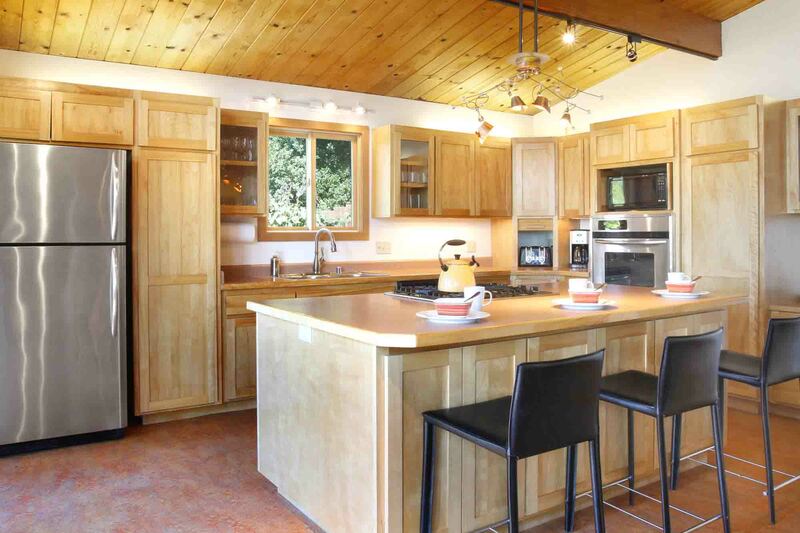 It's everything you'd want for a relaxing Russian River getaway -- peace, quiet, clean home, nice appliances, etc. We loved it and will be back! I would have easily given this home 5 stars but it was advertised as having a solar heated pool but we found out the solar had not worked since it was fired up. Disappointed that the water was so cold.Also the refrigerator was not turned on early enough and when we loaded our food it was warm and stayed that way for 24 hours. We had to put our perishables in a cooler with ice.On the positive this was a well kept home with lots of little touches that made it so comfy. The view was magnificent. I would rent again knowing in advance that I would not be swimming. Russian River Getaways just always delivers - this house is gorgeous. The boys headed off and played golf while the girls spent most afternoons cooling in the pool as we were there during a heatwave. 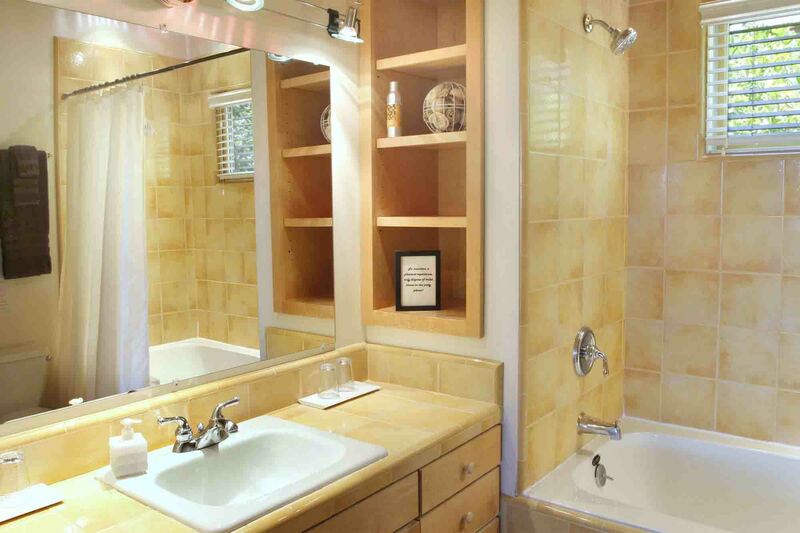 Soleil is modern and spanking clean with plenty of room to spread out. My only gripe is that there were no umbrella and loungers for around the pool (apart from those plastic venus-fly-trap things from the 70s). Also would have loved some loungers and umbrella on the deck upstairs where I spent evenings with a glass of vino watching the eagles hunt in the trees down below us - just spectacular. "The House in the Heavens"
We loved the house! But, there were a few things that would have been good to know prior to arriving. As you go up Summit Drive the house is not visible from the road. All you can see is a fence with the house number on it. The pool is 4 foot deep throughout (which was perfect for my son). There is not a staircase inside the house. To access the downstairs room you must use the outside stairs. This makes it nice if you are sharing the home with another couple but not so great for a family with smaller children. 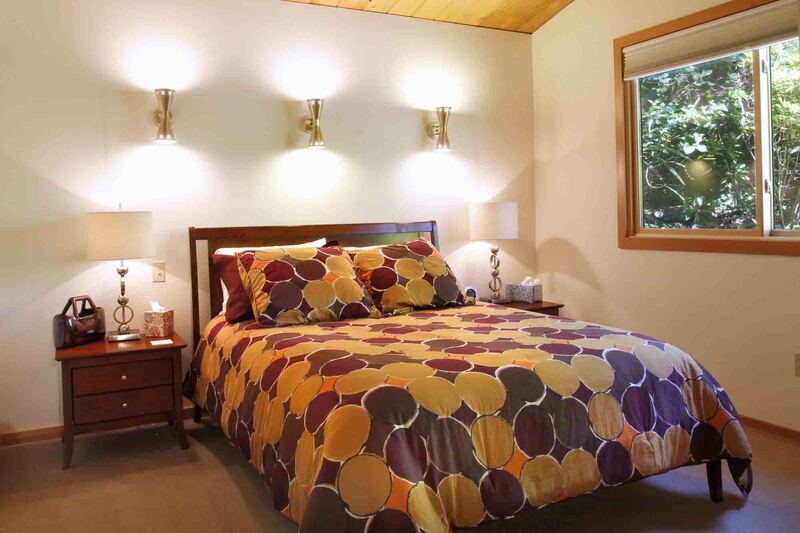 Both of the upstairs rooms have queen beds; the king bed is in the downstairs room. The home does not have air conditioning but there is usually a nice breeze to cool off the upstairs. None of these are negatives, but would have been good to know at the time of booking. The home was clean, well equipped and in wonderful condition. The view is amazing! When we woke up and looked out the fog was below us...hence us naming it The House in the Heavens. The have a lovely garden complete with two garter snakes. We never saw them but the book in the house tells you they are there for insect control. If you are bringing a dog keep in mind that there is no grassy area and there is a drop off on the far side of the pool. We brought expens and gated off the access to the drop off area. I spent 3 nights here with some girlfriends and we had a great time. The view is amazing. We did a lot of cooking and were so pleased with the kitchen set-up. We all noted how clean and new everything looked, and how comfy the beds were. We had a great time both indoors and outdoors. The only thing we would have changed is that the downstairs bedroom has a separate entrance (i.e. it is not internally connected to the upstairs, so you have to go outside and up the deck stairs to get upstairs), but that wasn't even a big deal. We'll definitely be back next summer. Good views of the valley. The house seems was recently renovated. But spartan furnishings and bedding is much desired. Don't expect any luxury out this house beside the views. We have forgot our set pillow and paid for it with neck pain next day. The extra propane tank for BBQ grill (which was very clean) was great. The house has most of what you might need but just bear bones. No Dvd's.The water in the pool was still cold in late May but that what you should expect. Very steep climb to the house on a very narrow road. Make sure your car can handle it without spinning down the hill.The only downside is very nasty neighbor who leaves there permanently and will call the cops on you if he feels you are disturbing him even it's only 9 pm. Each of our homes have their own flavor and charm. Some have many nick nacks scattered around and some are like Soleil, open and airy. It's important to look closely at the photographs we have of each home so that you can stay in one more suited to your likes. The drive up to the home is quite steep but the views when you get there more than make up for it! We have spoken to the neighbor regarding the Sonoma County noise ordinance and we are very sorry if he bothered you. We do have an emergency line that you needed to call so that we could have assisted you in this situation. "Remote hilltop getaway with amazing views"
House was well equipped and nicely laid out, and just close enough to town that it feels convenient even though once you're there, you're out in the woods. The views are nothing short of incredible. It's a roller coaster ride getting up the hill, and the turnoff can be tough to catch at night, but easy once you've done it once. Very comfortable for four of us, would have been just fine with the full six. My only pet peeve is the lighting in the front walkway - there's none, which makes returning home a t night a little dicey. Soleil was a wonderful place to stay for our mini-break from the city. The house is nice, new and clean. The pictures do a good job representing what it looks like. We cooked in both nights and enjoyed the open floor plan. The view is amazing from the deck and the pool - a nice treat at night with a glass of wine or in the morning for breakfast. It felt quiet and secluded and really allowed us to relax. This was the fourth time we have rented from Rrgetaways, but the first time we have stayed in Soleil, what a great house! Soleil was a very nicley updated and modern house, I'm a bit of a nut when it comes to clean rental homes, and this one was clean. The beds and bedding made me never want to get up in the morning. The upper floor is very bright and open with a great kitchen. We could have sat next to the pool and looked over the edge at the view forever. We will be back next year to Soleil house! I would like to say that the road going up to the house is not for the weak of heart, or a weak transmission! Be sure to get the directions to go up the back way, and it becomes more scary after dark when the deer come out to play on the road! Oh, and did I mention that the road is a two way street that is not much wider than a bike path in sections? But that being said, it was still that wonderful, we just didn't leave the house much! Soleil is a lovely home - my family (6 adults) thoroughly enjoyed our stay. All bedrooms were spacious, as were the main living quarters. The best part of the house is the deck - from the deck, there are sweeping views. The house is located at the very top of a steep climb, which makes the view spectacular. We relaxed by the pool, and enjoyed the peace and quiet and the many hummingbirds who came for a visit. The pool isn't huge, but is more than adequate, and again, affords a wonderful view of the forest and river. I would definitely stay at Soleil again - highly recommended. Our experience was lovely!The house is beautiful, clean &amp; bright! Kitchen had everything we needed!! !Rrg is a great company!Thank-you!!! The views were great, the house was well appointed. I can't say enough good things about Soleil. The location, excellent. The view, spectacular. The layout of the house, ideal for a a group of friends. The pool area, relaxing and picturesque. Everything was just perfect. I'll definitely be returning to Soleil in the future. "Wonderful home - sucky neighbors"
We really enjoyed the home and the services of Russian River Getaways, but the neighbor put a big damper on our weekend by complaining about every little noise we made... even at 11:00am...We also had a nasty note tacked on our gate, warning us to be quiet or the police would be called and we would be kicked out. This house was amazing! I have rented from RR Getaways in the past by far this is the best house ever. 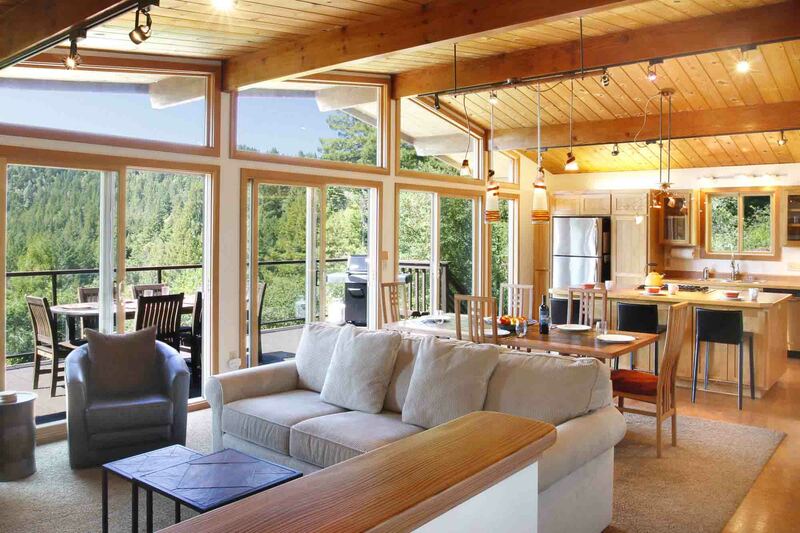 The house is beautifully located in the redwoods with magnificent views. The bedrooms were nicely decorated and beds were extremely comfortable, especially the master bedorom with its own bath. The house is adequately equipped with appropriate kitchen utensils, just need to snoop around a bit to find them. One thing that was lacking were pot holders for anything coming out of the oven. My partner and I rented this house with 3 other adults. The living room area is a bit tight for 5 adults, but we managed to make do while catching up on the worldly news. I would highly recommend this house for families with older children or a group of friends traveling together. The upper deck does have glass panels which did not appear to be child friendly - also stairs going down to the pool area and hot tub. The pool looked inviting but we did not have it heated. The hot tub was fun - can comfortably fit 4 adults...just cleanliness was a concern. I informed RR Getaways and I am sure that has been addressed by now. As far as the appliances - everything is practically brand new and green! I love that since I work for a company at an Ivy League University that bases its vision on sustainability! If you looking for a great getaway that has spectacular views, this is the place to be! Can't wait to rent again!